Published: Jan. 22, 2013 at 03:52 p.m. Updated: Jan. 23, 2013 at 06:54 a.m.
As I previously wrote, Senior Bowl week is my time to go to school on this class of prospects. That essentially amounts to listening to what NFL Network analysts say and jotting it down. 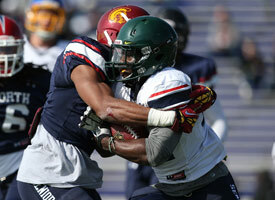 Check out all the action as NFL hopefuls prepare for the 2013 Senior Bowl. Robinson is making a position change to wide receiver. He's not 100 percent healthy but looked pretty good on a few deep routes Tuesday. It will be a bumpy transition, but Robinson has the athleticism to pull it off. He'll have to add value as a return man. Mayock calls Ansah a first-round talent who just hasn't shown it. Ansah didn't really play until this year, and needs to prove he can measure up to top competition. The Estonia native is nicknamed the "Eastern Block" for his 17 blocked kicks in college. Hunt is a physical specimen that had some hype coming into the season but didn't really produce. Mayock says Hunt needs to show he can bend, hold the point of attack and get up the field. Howie's son and Chris' brother has only played one year at offensive tackle after playing on the defensive line at Saddleback Junior College. Long was a former pitching prospect that got a DUI, so he'll have to answer questions about that. Long missed Tuesday's practice with the flu.